To follow up on PAs updates on KEEP hardware, which is nearing completion in a quick pace, it is now time to do the same with regards to the software development. Those not familiar with KEEP. KEEP is the followup to OPI a 100% open source mini server that is intended to keep your private information private. Contacts, calendars, email and photos are information that is yours, and information that should be shared on your conditions. You can read more about the specs of KEEP here. The big news here is most likely that we skipped Ubuntu this time in favor of the “newly” released Debian Stretch. We always have had a preference for Debian before Ubuntu since we love pure open source without any strange licensing policies. Unfortunately when we worked on OPI there where no up to date stable Debian and thus we then chose the latest Ubuntu LTS as a base platform. Thus KEEP is based on a solid Debian base, we even use the Debian packaged kernel with KEEP. Most other packages is the same as used in OPI but of course upgraded. The only difference in the base platform is the move from MySQL to MariaDB. 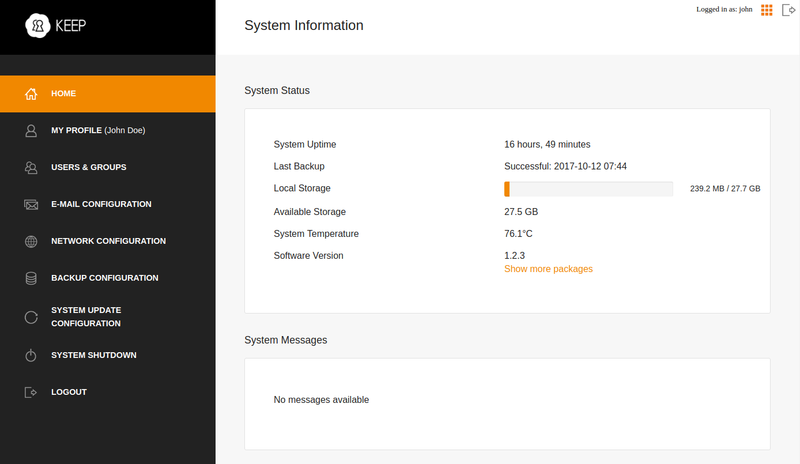 The backup system, based on S3QL, has gotten a complete overhaul. We added support for backup onto Amazon S3 storage and implemented a migration path from a previously made backup from an OPI. When focusing on the web applications that we package the big change is that we have chosen to use Nextcloud instead of Owncloud. Mostly since Nextcloud seems to be the more active community and that they have a more relaxed code contribution policy. We have also added the tasks application from Nextcloud as a supported application which more or less completes the personal information management needs. Running the software stack on KEEP is a really nice experience due to the upgraded hardware specifications and the upgrade to PHP7. The Nextcloud application, which where the big problem on OPI, runs comfortably even on full page reloads. The current development status is that we are currently working on porting our own “plugins” to Roundcube and Nextcloud. We have two plugins for Roundcube one to integrate with the Nextcloud contacts to unify contact management and the other is a plugin that exports identities, personal mail addresses used when composing emails, from the OP backend. For Nextcloud we have a few adaptations, firstly we have an authentication plugin that integrates with the OP backend systems. We have a centralized user management that store user identities and passwords in an encrypted database. Finally the last piece to complete before we move to the final test phase of development is to update all theming, to make all components share a common graphical profile and integrate more cleanly with each other. When that is done we have to run a few rounds of system test and probably some more bug fixing, But all in all the software for KEEP is shaping up really nicely and we have no, known, blocker issues at this moment. Thus all should be set for a release in a not to distant future. Looking ahead we have a lot of ideas on what else would be nice to have. But we first have to let the dust settle with this release and then we take it from there. If you have any questions. ideas or comments please comment below or send us an email. We love to get feedback from you all!